What is the best way to layout a group of checkboxes and supporting form fields? For instance, in this form the user can select several choices for a report delivery method. Some of the choices require additional information such a email address, fax number, or folder location. I'd like to keep the checkboxes near each other so it is easier for the user to choose one or several report delivery options. Below is a screenshot of the checkboxes and supporting text fields. 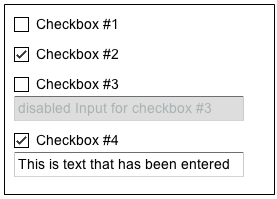 Supporting text fields will become active/disabled as the appropriate checkbox is marked. Rather than try to put all the checkboxes together, I would list them vertically with any fields below or next to them. This way it is easier to scan, and the association is stronger between the checkbox and the fields. Please note that I am suggesting the principle here, not the design. If you place your checkboxes vertically and fields with additional information for particular checkbox to the right of them it looks more logically. If you worry about growth of emails list, you can do it as text field with fixed width and two buttons at the right of it - Edit and Clear. Pressing Edit starts another form or control for editing the list, pressing Clear - cleares the list. 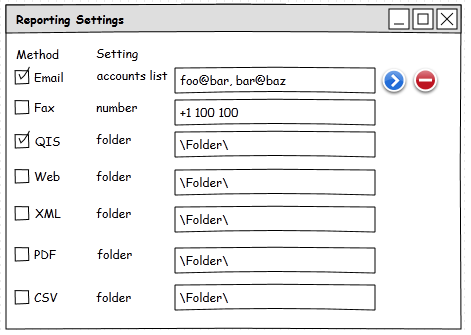 With JohnGB solution, you could only display input field when a asociated checkbox is active. Only show input "fax number" when fax is checked. Not the answer you're looking for? Browse other questions tagged forms usability gui-design layout checkboxes or ask your own question. How can I improve the experience of filling this form in? How should regular black text change to show that it has become editable?